This is not really about the fishcakes–they’ve featured before and in fact are one of the most popular recipes on my blog. It’s about how a single item found in the market/shop/fridge can lead to lunch. Yesterday at the organic market in Castres a producer with whom I regularly shop had a little bunch of dill hiding modestly behind the parsley. I picked it out and it was perky with that fresh, inimitable scent. She told me it had grown back unexpectedly. Dill, like coriander, is tricky to grow. Dill is delicious with thinly sliced cucumber and red onion in a simple salad–but this bunch shouts FISHCAKES in my ear. Thus, it’s fishcakes in a little tomato coulis for lunch today. The recipe appears in my first cookbook–Delicious Dishes for Diabetics and in the new cookbook, Mediterranean Cooking for Diabetics. A variation using smoked haddock appears in my second cookbook, Healthy Eating for Life, also delicious. They are served with a yogurt sauce in the books. The key point is there is no potato filler–so it’s low carb. It’s vital to make the pan hot. Avoid working them too much! You don’t want slush at the end. You could just cut them by hand if this suits better. Place the the salmon in a bowl and add the egg white and the flour, then the mustard, lemon juice and the dill. Using a dessertspoon, scoop out a dollop. Arrange these on a plate and refrigerate, if not using immediately. When you are ready to eat, heat the oil in a frying pan to HOT. Depending on the thickness this takes about a minute each side. I found more dill in today’s market–any suggestions? “Encore FISHCAKES!” you’ll cry, after sampling these. Whisk the yogurt to a smooth texture and fold in the dill and mustard. * If you prefer a thicker yogurt sauce, drain it in a sieve for 10 minutes or so. Dill, for me, is about how a single ingredient can bring back memories. My two years of living in Bulgaria and the flavour of the tarator, a delicious summer soup prepared with yogurt, cucumbers, garlic, water, oil, walnuts and DILL. In this rainy day, your bunch of dill, brings me sunshine! Thank you Simonetta–sounds perfect for a summer lunch. 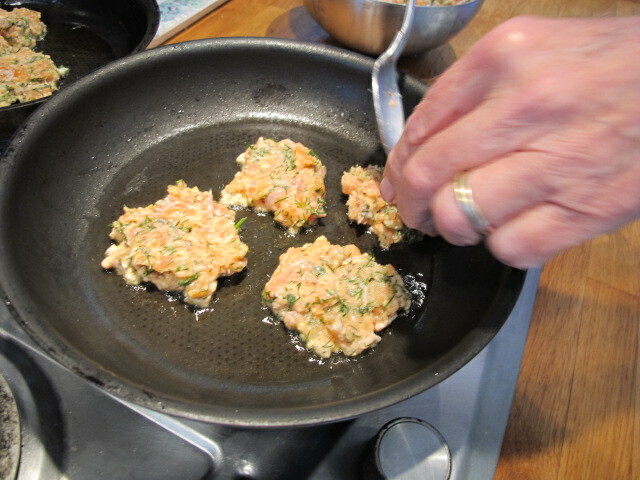 My husband, David, said I must share my salmon latke receipy with you. I too use dill and pepper, paprika, but no salt, I have to keep this low. I use canned red sockeye salmon. So if run out of fresh stuff his a great meal for supper ( I am in the US of A so say canned rather than tinned) Diced green onions, The salmon drained The seasoning Add an egg or two depending on how many cans one opens Add matzo meal, you will use chickpea flour. I shall have to see if I can find this, Mush it all together Wet hands and make balls which I drop into bread crumbs, guess you could use gluten free bread crumbs And fry in a mixture of olive oil and vegetable oil until crisp. Want less fat sprinkle pan with oil and bake in oven, 375 to 400 degrees F. Don’t know Celsius reading. They are yummy hot or cold. I cut one up and put it on a salad. Hope you don’t mind my sharing with you Your receipies always inspire me o try something different. This sounds good, Rachel , thanks. Sockeye salmon? Love the name. I have been craving salmon all week. You have given me a great recipe for dinner. I thank you for that. 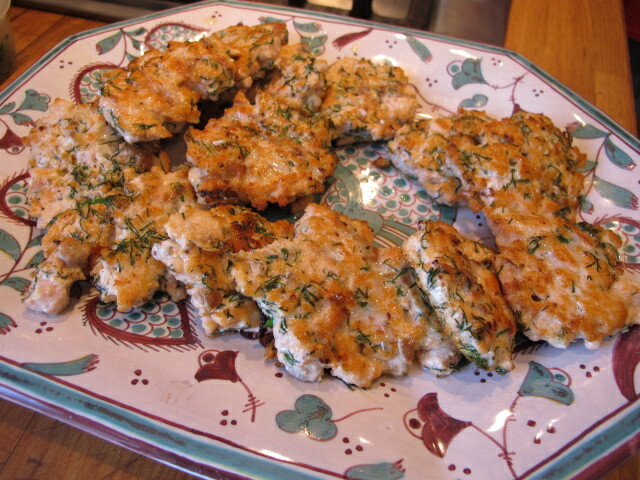 I love the idea of these potato-less fish cakes – all too often they are stuffed with potatoes. Looking forward to tomorrow night and the burning of Trenwith – but I do miss Ralph Bates – he was so wicked as George. im thinking salsa verde with all your dill !!! I do love dill! I think the fish cakes would be delicious, but I also like the look of the dill in that little pitcher. I think it functions as edible and decorative! Like the recipe. Salmon is a good source of Vitamin D too…something we’re short of in England during winter months with not much sun. Last week, I learnt how to prepare avocado. Tasty! I have never bought them before. So we’re learning from you about healthy eating. Thank you. A timely and delicious reminder to make what I call salmon patties. Never use flour (even gluten free), but bind the ingredients with a little moutard and beaten egg. Cook slowly in an electric skillet and top with mayo sprinkled with more fresh dill. Yummy and a nice change from red meat. I have never tried this recipe Robin, but it is time I should do it as I like saumon – especially smoked in fresh salads with lots of lemon and balsamic vinegar – It is anyway difficult to find fresh dill. To me it is quite similar to the “finocchiello selvatico”=wild fennel (?). But I am wondering if they have a similar taste as well. See you soon! Looks very scrummy Robin, I have always had an addiction to dill I would imagine you would be able to grow dill where you live very easily, non? No luck with it here. Dear Ross, today on the literary supplement of “Corriere della Sera” (one of the most important Italian newspapers) big photo of you and Angharad Rees: soon in the bookshops the Italian translation of Winston Graham novels (and the new tv series on digital tv). I thought you might be glad to know that Ross (an then you) is always at the forefront! Should you be interested in seeing the article I can send it to you as a pdf (or maybe you can find it in the web). PS The title is “FIfty shades of Ross Poldark”, being “rosso” (a bit like “Ross”) Italian word for “red”. Sorry,not food related…..hope you enjoyed the season finale last night. I know I did. Yes watched it last night–enjoyed it hugely. I am addicted to dill especially after having read some Scandinavian Noir which lovingly described a salmon dish with a ‘crown of dill’ . I had some for lunch today, flung into a coleslaw made with red cabbage and rocket . Hi Robin, I made these while staying in your favourite Fowey. Like you I went for freeform rather than perfection and the results were delicious. I’ve been low-carbing since February and have successfully reversed my Type 2, so these are a welcome addition to the regime. Santé! Was reading about the Christmas markets in Castres. What’s raclette, Mr. Ellis? Raclette is a dish indigenous to parts of Switzerland. The raclette cheese round is heated, either in front of a fire or by a special machine, then scraped onto diners’ plates; the term raclette derives from the French word racler, meaning “to scrape”, a reference to the fact that the melted cheese must be scraped from the unmelted part of the cheese onto the plate. Traditionally the melting happens in front of an open fire with the big piece of cheese facing the heat. One then regularly scrapes off the melting side. It is accompanied by small firm potatoes (Bintje, Charlotte or Raclette varieties), gherkins, pickled onions, and dried meat, such as jambon cru/cuit and viande des Grisons, and to drink, Kirsch, herbal tea or Fendant (wine from the Chasselas grape). A sort of fondue in other words. Yum! I used to live in Switzerland and always make seasonal dishes, e.g. Bratwurst with Roesti (Yum! ), Zwetschkuchen (plum tart), etc. In fact later this month I’ll make the Bratwurst & Roesti with sauerkraut to observe a folk festival in Bern called Zwiebelmarit (needs an umlaut over the “a”). That’s when farmers from all around bring in onions (some braided in long ropes) and other goods and sell them along with other goods in an outdoor market. It’s also when all the young boys rampage through the streets and arcades of the Old Town, tossing confetti and generally making merry. Last month I made a wonderful open plum tart (Zwetschkuchen) in memory of those I ate in Klosters. Another Yum! Thanks for the explanation! I had never heard of it. It all sounds very nice. It just said that they serve raclette and oysters at the Christmas market there in France. Oh thank you Robin. This gluten free recipe has cheered me up a bit , considering I’m watching the election result ! Just hoping things will improve for the US in the next few hours. Hope Meredith is okay! Hope at least you enjoy the fishcakes. Thank you Robin. I could not believe the outcome of the vote, and when I wrote to you the other morning, I was sure things would change for the better. Devastated yes. What a difficult year this has been in so many ways. I do hope you and Meredith have a wonderful time in Florence, forgetting what is happening across the pond for a while.